You've spent hours memorizing Yellow Devil's movement patterns. You can jump every one of Gutsman's attacks. You can even beat Metalman without taking a single point of damage, using only the Buster Shot. You know everything there is to know about Mega Man video games, from 1 all the way to 10. 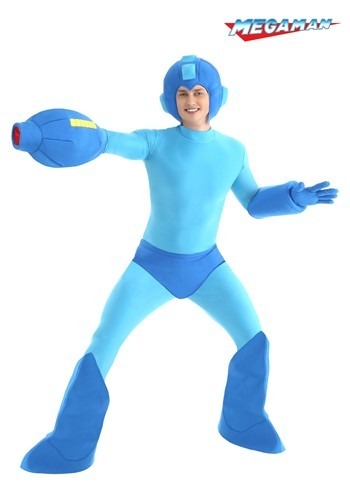 Now, it's time to give this Adult Mega Man Costume a shot. It makes you look just like the 8-bit character! You can fight new robot bosses at the next costume party, like Double-Dip Man. (We hear Dr. Wily created him to ruin party experiences across the world). Have you been trying to fight robot bosses in your neighborhood? It's probably not a good idea unless you have this Adult Proto Man Helmet. Licensed from the Mega Man games, it gives you the look of the Buster Shot blasting robot who's got a penchant for beating up baddies and also carries a dash of mystery with him. Just remember to whistle Proto Man's theme when you make a dynamic entry into a room!